At the register, we have a coin jar for the animal shelter in town. It has a picture of a black cat, and my boss feels the need to tape a post-it note over it so it does not show. Another time, a black cat ran across our parking lot and he ran into his office and hid away from the animal. There are many superstitions made. Examples such as walking under ladders, breaking mirrors, and using an umbrella indoors are a few common superstitions. I feel as though many people follow and assume the idea that if a black cat crosses your path, you will have bad luck. Unfortunately, there are a good amount of rules for animal shelters that forbade adoption of self black cats around Halloween, because people have harmed them for mischief. Some information regarding black cats are seen in our western culture. 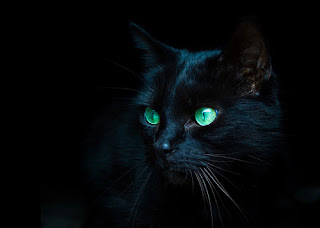 We look at black cats as bad omens, and associated with “witches” and black luck. When a “witch” has a close animal they are known as familiars. Some regions point of view consider a black cat to be good luck, such as in Japan. In ours though, it symbolizes hardship and death. It is said that the black cat could shape shift and spy for their “witches.” And in history some people have been killed for owning a black cat. Also many people have killed a number of black cats in the middle ages. Some farmers would shoot a black cat to death is their crops were not producing well. However, to some people, black cats brought on good luck. King Charles I had a black cat and the day that his pet died he was scared that his good luck ran out. In Ancient Egypt, black cats were a symbol of royalty. Wives of fishermen kept black cats to have good faith in their husbands well being. The question at issue is if black cats bring on misfortune or death? This depends on your culture and personal view. I personally feel that black cats are beautiful and wonderful cats just like any other. There are many regions that look at a black cat as good luck and bad luck. When there are unexplainable events, people tend to look for reasons. These are how superstitions are made. If something good happens, then they look for a reason and same as if it was a bad event or circumstance. I liked this blog post a lot. I find it absolutely fascinating that black cats are seen as good luck in other cultures. Also, it's amazing that "luck" brought by a cat has been determined simply by fur color, for centuries. I am saddened that some people have used the "bad luck" excuse for animal abuse, but I feel like we are less superstitious today overall. And I agree with you; black cats and other black animals are beautiful, and have been used as mere scapegoats in the superstitious frame of mind. I've currently got five cats at home, three of whom are black. They are wonderful critters, and my oldest, Cosmo, is nearly 20! As a total "animal person," I can't imagine finding them to be anything other than their lovable, fuzzy little selves, but it's amazing some of the notions that people have developed regarding certain animals. I hope to work in animal advocacy after graduation and especially towards the protection of endangered species. It makes me crazy to imagine that certain species are hunted nearly to extinction because, for example, the horn of the black rhinoceros is thought (imagined?) to have properties that enhance male potency... I mean, come on, we are over-populating the planet already, and yet we'd kill an endangered species for something as stupid as that? We are a truly despicable species... (/rant) Great post, by the way.